Languages spoken in India belong to several language families, the major ones being the Indo-Aryan languages spoken by 78.05% of Indians and the Dravidian languages spoken by 19.64% of Indians. Languages spoken by the remaining 2.31% of the population belong to the Austroasiatic, Sino-Tibetan, Tai-Kadai and a few other minor language families and isolates. :283 India (780) has the world's second highest number of languages, after Papua New Guinea (839). Nihali, Kusunda and Thai languages are not shown. Article 343 of the Indian constitution stated that the official language of the Union should become Hindi in Devanagari script instead of the extant English. But this was thought to be a violation of the constitution's guarantee of federalism. Later, a constitutional amendment, The Official Languages Act, 1963, allowed for the continuation of English in the Indian government indefinitely until legislation decides to change it. The form of numerals to be used for the official purposes of the Union were supposed to be the international form of Indian numerals, distinct from the numerals used in most English-speaking countries. Despite the misconceptions, Hindi is not the national language of India. The Constitution of India does not give any language the status of national language. The Eighth Schedule of the Indian Constitution lists 22 languages, which have been referred to as scheduled languages and given recognition, status and official encouragement. In addition, the Government of India has awarded the distinction of classical language to Kannada, Malayalam, Odia, Sanskrit, Tamil and Telugu. Classical language status is given to languages which have a rich heritage and independent nature. According to the Census of India of 2001, India has 122 major languages and 1599 other languages. However, figures from other sources vary, primarily due to differences in definition of the terms "language" and "dialect". The 2001 Census recorded 30 languages which were spoken by more than a million native speakers and 122 which were spoken by more than 10,000 people. Two contact languages have played an important role in the history of India: Persian and English. Persian was the court language during the Mughal period in India. It reigned as an administrative language for several centuries until the era of British colonisation. English continues to be an important language in India. It is used in higher education and in some areas of the Indian government. Hindi, the most commonly spoken language in India today, serves as the lingua franca across much of North and Central India. However, there have been anti-Hindi agitations in South India, most notably in the state of Tamil Nadu and Karnataka. Maharashtra, West Bengal, Assam, Punjab and other non-Hindi regions have also started to voice concerns about Hindi. The Southern Indian languages are from the Dravidian family. The Dravidian languages are indigenous to the Indian subcontinent. Proto-Dravidian languages were spoken in India in the 4th millennium BCE and started disintegrating into various branches around 3rd millennium BCE. The Dravidian languages are classified in four groups: North, Central (Kolami–Parji), South-Central (Telugu–Kui), and South Dravidian (Tamil-Kannada). The Northern Indian languages from the Indo-Aryan branch of the Indo-European family evolved from Old Indic by way of the Middle Indic Prakrit languages and Apabhraṃśa of the Middle Ages. The Indo-Aryan languages developed and emerged in three stages — Old Indo-Aryan (1500 BCE to 600 BCE), Middle Indo-Aryan stage (600 BCE and 1000 CE) and New Indo-Aryan (between 1000 CE and 1300 CE). The modern north Indian Indo-Aryan languages all evolved into distinct, recognisable languages in the New Indo-Aryan Age. Persian or Farsi, was brought into India by the Ghaznavids and other Turko-Afghan dynasties as the court language. Culturally Persianized, they, in combination with the later Mughal dynasty (of Turco-Mongol origin), influenced the art, history and literature of the region for more than 500 years, resulting in the Persianisation of many Indian tongues, mainly lexically. In 1837, the British replaced Persian with English and Hindustani in Perso-Arabic script for administrative purposes and the Hindi movement of the 19th Century replaced Persianised vocabulary with Sanskrit derivations and replaced or supplemented the use of Perso-Arabic script for administrative purposes with Devanagari. Each of the northern Indian languages had different influences. For example, Hindustani was strongly influenced by Sanskrit, Arabic and Persian, leading to the emergence of Modern Standard Hindi and Modern Standard Urdu as registers of the Hindustani language. The first official survey of language diversity in the Indian subcontinent was carried out by Sir George Abraham Grierson from 1898 to 1928. 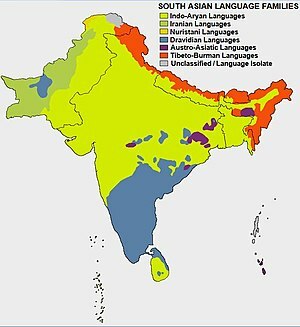 Titled the Linguistic Survey of India, it reported a total of 179 languages and 544 dialects. However, the results were skewed due to ambiguities in distinguishing between "dialect" and "language", use of untrained personnel and under-reporting of data from South India, as the former provinces of Burma and Madras, as well as the princely states of Cochin, Hyderabad, Mysore and Travancore were not included in the survey. The People’s Linguistic Survey of India, a privately owned research institution in India, has recorded over 66 different scripts and more than 780 languages in India during its nationwide survey, which the organisation claims to be the biggest linguistic survey in India. The People of India (POI) project of Anthropological Survey of India reported 325 languages which are used for in-group communication by 5,633 Indian communities. The Census of India records and publishes data with respect to the number of speakers for languages and dialects, but uses its own unique terminology, distinguishing between language and mother tongue. The mother tongues are grouped within each language. Many of the mother tongues so defined could be considered a language rather than a dialect by linguistic standards. This is especially so for many mother tongues with tens of millions of speakers that are officially grouped under the language Hindi. Separate figures for Hindi, Urdu, and Punjabi were not issued, due to the fact the returns were intentionally recorded incorrectly in states such as East Punjab, Himachal Pradesh, Delhi, PEPSU, and Bilaspur. The 1961 census recognised 1,652 mother tongues spoken by 438,936,918 people, counting all declarations made by any individual at the time when the census was conducted. However, the declaring individuals often mixed names of languages with those of dialects, subdialects and dialect clusters or even castes, professions, religions, localities, regions, countries and nationalities. The list therefore includes languages with barely a few individual speakers as well as 530 unclassified mother tongues and more than 100 idioms that are non-native to India, including linguistically unspecific demonyms such as "African", "Canadian" or "Belgian". The 1991 census recognises 1,576 classified mother tongues. According to the 1991 census, 22 languages had more than a million native speakers, 50 had more than 100,000 and 114 had more than 10,000 native speakers. The remaining accounted for a total of 566,000 native speakers (out of a total of 838 million Indians in 1991). According to the most recent census of 2001, there are 1635 rationalised mother tongues, 234 identifiable mother tongues and 22 major languages. Of these, 29 languages have more than a million native speakers, 60 have more than 100,000 and 122 have more than 10,000 native speakers. There are a few languages like Kodava that do not have a script but have a group of native speakers in Coorg (Kodagu). The language-related data results of the 2011 Census have not yet been released by the Government of India. The largest of the language families represented in India, in terms of speakers, is the Indo-Aryan language family, a branch of the Indo-Iranian family, itself the easternmost, extant subfamily of the Indo-European language family. This language family predominates, accounting for some 1035 million speakers, or over 76.5 of the population, as per 2018 estimate. 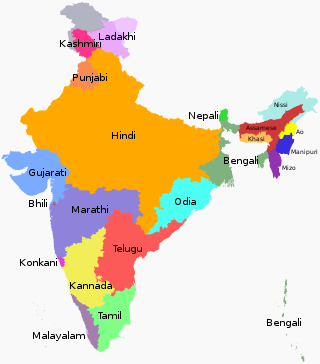 The most widely spoken languages of this group are Hindi, Bengali, Marathi, Urdu, Gujarati, Punjabi, Kashmiri, Rajasthani, Sindhi, Assamese (Asamiya), Maithili and Odia. Aside from the Indo-Aryan languages, other Indo-European languages are also spoken in India, the most prominent of which is English, as a lingua franca. The second largest language family is the Dravidian language family, accounting for some 277 million speakers, or approximately 20.5% as per 2018 estimate The Dravidian languages are spoken mainly in southern India and parts of eastern and central India as well as in parts of northeastern Sri Lanka, Pakistan, Nepal and Bangladesh. The Dravidian languages with the most speakers are Telugu, Tamil, Kannada and Malayalam. Besides the mainstream population, Dravidian languages are also spoken by small scheduled tribe communities, such as the Oraon and Gond tribes. Only two Dravidian languages are exclusively spoken outside India, Brahui in Pakistan and Dhangar, a dialect of Kurukh, in Nepal. Families with smaller numbers of speakers are Austroasiatic and numerous small Sino-Tibetan languages, with some 10 and 6 million speakers, respectively, together 3% of the population. Sino-Tibetan languages are spoken across the Himalayas in the regions of Ladakh, Himachal Pradesh, Nepal, Sikkim, Bhutan, Arunachal Pradesh, and also in the Indian states of West Bengal, Assam (hills and autonomous councils), Meghalaya, Nagaland, Manipur, Tripura and Mizoram. Sino-Tibetan languages spoken in India include the scheduled languages Meitei and Bodo, the non-scheduled languages of Karbi, Lepcha, and many varieties of several related Tibetic, West Himalayish, Tani, Brahmaputran, Angami–Pochuri, Tangkhul, Zeme, Kukish language groups, amongst many others. Ahom language, a Southwestern Tai language, had been once the dominant language of the Ahom Kingdom in modern-day Assam, but was later replaced by the Assamese language (known as Kamrupi in ancient era which is the pre-form of the Kamrupi dialect of today). Nowadays, small Tai communities and their languages remain in Assam and Arunachal Pradesh together with Sino-Tibetans, e.g. Tai Phake, Tai Aiton and Tai Khamti, which are similar to the Shan language of Shan State, Myanmar; the Dai language of Yunnan, China; the Lao language of Laos; the Thai language of Thailand; and the Zhuang language in Guangxi, China. the Great Andamanese, comprising a number of extinct languages apart from one highly endangered language with a dwindling number of speakers. the Ongan family of the southern Andaman Islands, comprising two extant languages, Önge and Jarawa, and one extinct language, Jangil. In addition, Sentinelese, an unattested language of the Andaman Islands, is generally considered to be related and part of the aerial group. The only language found in the Indian mainland that is considered a language isolate is Nihali. :337 The status of Nihali is ambiguous, having been considered as a distinct Austroasiatic language, as a dialect of Korku and also as being a "thieves' argot" rather than a legitimate language. The language families in India are not necessarily related to the various ethnic groups in India, specifically the Indo-Aryan and Dravidian people. The languages within each family have been influenced to a large extent by both families. Urdu has also had a significant influence on many of today's Indian languages. Many North Indian languages have lost much of their Sanskritised base (50% current vocabulary) to a more Urdu-based form. In terms of the written script, most Indian languages, nearly perfectly accommodate the Sanskrit language. South Indian languages have adopted new letters to write various Indo-Aryan based words as well, and have added new letters to their native alphabets as the languages began to mix and influence each other. Though various Indo-Aryan and Dravidian languages may seem mutually exclusive when first heard, there is a much deeper underlying influence that both language families have had on each other down to a linguistic science. There is proof of the intermixing of Dravidian and Indo-Aryan languages through the pockets of Dravidian-based languages on remote areas of Pakistan, and interspersed areas of North India. In addition, there is a whole science regarding the tonal and cultural expression within the languages that are quite standard across India. Languages may have different vocabulary, but various hand and tonal gestures within two unrelated languages can still be common due to cultural amalgamations between invading people and the natives over time; in this case, the Indo-Aryan peoples and the native Dravidian people. States and union territories of India by the most commonly spoken (L1) first language. Prior to Independence, in British India, English was the sole language used for administrative purposes as well as for higher education purposes. In 1946, the issue of national language was a bitterly contested subject in the proceedings of the Constituent Assembly of India, specifically what should be the language in which the Constitution of India is written and the language spoken during the proceedings of Parliament and thus deserving of the epithet "national". Members belonging to the northern parts of India insisted that the Constitution be drafted in Hindi with the unofficial translation in English. This was not agreed to by the drafting Committee on the grounds that English was much better to craft the nuanced prose on constitutional subjects. The efforts to make Hindi the pre-eminent language were bitterly resisted by the members from those parts of India where Hindi was not spoken natively. Eventually, a compromise was reached with Hindi in Devanagari script to be the official language of the union but for "fifteen years from the commencement of the Constitution, the English Language shall continue to be used for all the official purposes of the Union for which it was being used immediately before such commencement". As the date for changeover approached, however, there was much alarm in the non Hindi-speaking areas of India, especially in Kerala, Gujarat, Maharashtra, Tamil Nadu, Punjab, West Bengal, Karnataka, Puducherry and Andhra Pradesh. Accordingly, Jawaharlal Nehru ensured the enactment of the Official Languages Act, 1963, which provided that English "may" still be used with Hindi for official purposes, even after 1965. The wording of the text proved unfortunate in that while Nehru understood that "may" meant shall, politicians championing the cause of Hindi thought it implied exactly the opposite. In the event, as 1965 approached, India's new Prime Minister Lal Bahadur Shastri prepared to make Hindi paramount with effect from 26 January 1965. This led to widespread agitation, riots, self-immolations and suicides in Tamil Nadu. The split of Congress politicians from the South from their party stance, the resignation of two Union ministers from the South and the increasing threat to the country's unity forced Shastri to concede. As a result, the proposal was dropped, and the Act itself was amended in 1967 to provide that the use of English would not be ended until a resolution to that effect was passed by the legislature of every state that had not adopted Hindi as its official language, and by each house of the Indian Parliament. The Constitution of India does not give any language the status of national language. The Hindi-belt, including Hindi-related languages such as Rajasthani and Bhojpuri. Hindi, written in Devanagari script, is the most prominent language spoken in the country. In the 2001 census, 422 million (422,048,642) people in India reported Hindi to be their native language. This figure not only included Hindi speakers of Hindustani, but also people who identify as native speakers of related languages who consider their speech to be a dialect of Hindi, the Hindi belt. 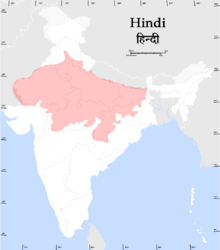 Hindi (or Hindustani) is the native language of most people living in Delhi, Uttar Pradesh, Uttarakhand, Chhattisgarh, Himachal Pradesh, Chandigarh, Bihar, Jharkhand, Madhya Pradesh, Haryana, and Rajasthan. "Modern Standard Hindi", a standardised language is one of the official languages of the Union of India. In addition, it is one of only two languages used for business in Parliament however the Rajya Sabha now allows all 22 official languages on the Eighth Schedule to be spoken. Hindustani, evolved from khari boli (खड़ी बोली), a prominent tongue of Mughal times, which itself evolved from Apabhraṃśa, an intermediary transition stage from Prakrit, from which the major North Indian Indo-Aryan languages have evolved. 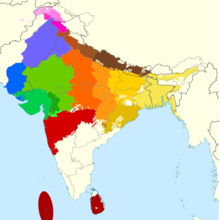 Varieties of Hindi spoken in India include Rajasthani, Braj Bhasha, Haryanvi, Bundeli, Kannauji, Hindustani, Awadhi, Bagheli, Bhojpuri, Magahi, Nagpuri and Chhattisgarhi. By virtue of its being a lingua franca, Hindi has also developed regional dialects such as Bambaiya Hindi in Mumbai. In addition, a trade language, Andaman Creole Hindi has also developed in the Andaman Islands. Hindi is widely taught both as a primary language and language of instruction, and as a second tongue in most states. British colonial legacy has resulted in English being a language for government, business and education. English, along with Hindi, is one of the two languages permitted in the Constitution of India for business in Parliament. Despite the fact that Hindi has official Government patronage and serves as a lingua franca over large parts of India, there was considerable opposition to the use of Hindi in the southern states of India, and English has emerged as a de facto lingua franca over much of India. Main languages of India and their relative size according to how many speakers each has. Until the Twenty-first Amendment of the Constitution of India in 1967, the country recognised 14 official regional languages. The Eighth Schedule and the Seventy-First Amendment provided for the inclusion of Sindhi, Konkani, Meitei and Nepali, thereby increasing the number of official regional languages of India to 18. The Eighth Schedule of the Constitution of India, as of 1 December 2007, lists 22 languages,:330 which are given in the table below together with the speaking population and the regions where they are used. The individual states, the borders of most of which are or were drawn on socio-linguistic lines, can legislate their own official languages, depending on their linguistic demographics. The official languages chosen reflect the predominant as well as politically significant languages spoken in that state. Certain states having a linguistically defined territory may have only the predominant language in that state as its official language, examples being Karnataka and Gujarat, which have Kannada and Gujarati as their sole official language respectively. Telangana, with a sizeable Urdu-speaking Muslim population, has two languages, Telugu and Urdu, as its official languages. Some states buck the trend by using minority languages as official languages. Jammu and Kashmir uses Urdu, which is spoken by fewer than 1% of the population. Meghalaya uses English spoken by 0.01% of the population. This phenomenon has turned majority languages into "minority languages" in a functional sense. In addition to states and union territories, India has autonomous administrative regions which may be permitted to select their own official language – a case in point being the Bodoland Territorial Council in Assam which has declared the Bodo language as official for the region, in addition to Assamese and English already in use. and Bengali in the Barak Valley, as its official languages. 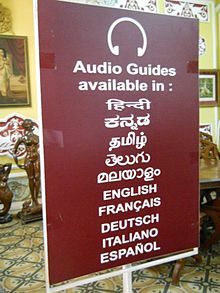 At a tourist site in Bangalore - Top to bottom, the languages are Hindi, Kannada, Tamil, Telugu, and Malayalam. English and many other European languages are also provided here. Making "Hindi", which a plurality of the people (41%) identified as their native language, the official language. Making English, as preferred by non-Hindi speakers, particularly Kannadigas and Tamils, and those from Mizoram and Nagaland, the official language. See also Anti-Hindi agitations. Declare both Hindi and English as official languages and each state is given freedom to choose the official language of the state. The Indian constitution, in 1950, declared Hindi in Devanagari script to be the official language of the union. Unless Parliament decided otherwise, the use of English for official purposes was to cease 15 years after the constitution came into effect, i.e. on 26 January 1965. The prospect of the changeover, however, led to much alarm in the non Hindi-speaking areas of India, especially in South India whose native tongues are not related to Hindi. As a result, Parliament enacted the Official Languages Act in 1963, which provided for the continued use of English for official purposes along with Hindi, even after 1965. Native to the Bengal region, comprising the nation of Bangladesh and the states of West Bengal, Tripura and Barak Valley region of Assam. Bengali (also spelt as Bangla: বাংলা) is the sixth most spoken language in the world. After the partition of India (1947), refugees from East Pakistan were settled in Tripura, and Jharkhand and the union territory of Andaman and Nicobar Islands. There is also a large number of Bengali-speaking people in Maharashtra and Gujarat where they work as artisans in jewellery industries. Bengali developed from Abahatta, a derivative of Apabhramsha, itself derived from Magadhi Prakrit. The modern Bengali vocabulary contains the vocabulary base from Magadhi Prakrit and Pali, also borrowings & reborrowings from Sanskrit and other major borrowings from Persian, Arabic, Austroasiatic languages and other languages in contact with. Like most Indian languages, Bengali has a number of dialects. It exhibits diglossia, with the literary and standard form differing greatly from the colloquial speech of the regions that identify with the language. Bengali language has developed a rich cultural base spanning art, music, literature and religion. There have been many movements in defence of this language and in 1999 UNESCO declared 21 Feb as the International Mother Language Day in commemoration of the Bengali Language Movement in 1952. Marathi is an Indo-Aryan language. It is the official language and co-official language in Maharashtra and Goa states of Western India respectively, and is one of the official languages of India. There were 83 million speakers in 2011 and 72 million speakers in 2001. Marathi has the third largest number of native speakers in India. Marathi has some of the oldest literature of all modern Indo-Aryan languages, dating from about 1200 AD (Mukundraj's Vivek Sindhu from the close of the 12th century). The major dialects of Marathi are Standard Marathi and the Varhadi dialect. There are other related languages such as Khandeshi, Dangi, Vadvali and Samavedi. Malvani Konkani has been heavily influenced by Marathi varieties. Marathi is one of several languages that descend from Maharashtri Prakrit. Further change led to the Apabhraṃśa languages like Old Marathi. Marathi is the official language of Maharashtra and co-official language in the union territories of Daman and Diu and Dadra and Nagar Haveli. In Goa, Konkani is the sole official language; however, Marathi may also be used for all official purposes. Over a period of many centuries the Marathi language and people came into contact with many other languages and dialects. The primary influence of Prakrit, Maharashtri, Dravidian languages, Apabhraṃśa and Sanskrit is understandable. At least 50% of the words in Marathi are either taken or derived from Sanskrit. Many scholars[who?] claim that Sanskrit has derived many words from Marathi. Marathi has also shared directions, vocabulary and grammar with languages such as Indian Dravidian languages, and foreign languages such as Persian, Arabic, English and a little from Portuguese. Telugu is the most widely spoken Dravidian language in India and around the world. Telugu is an official language in Andhra Pradesh, Telangana and Yanam, making it one of the few languages (along with Hindi, Bengali, and Urdu) with official status in more than one state. It is also spoken by a significant number of people in the Andaman and Nicobar Islands, Chhattisgarh, Karnataka, Maharashtra, Odisha, Tamil Nadu, Gujarat and by the Sri Lankan Gypsy people. It is one of six languages with classical status in India. Telugu ranks fourth by the number of native speakers in India (81 million in the 2011 Census), fifteenth in the Ethnologue list of most-spoken languages worldwide and is the most widely spoken Dravidian language. Tamil (also spelt as Thamizh: தமிழ்) is a Dravidian language predominantly spoken in Tamil Nadu, Puduchery and many parts of Sri Lanka. It is also spoken by large minorities in the Andaman and Nicobar Islands, Kerala, Karnataka, Andhra Pradesh, Malaysia, Singapore, Mauritius and throughout the world. Tamil ranks fifth by the number of native speakers in India (61 million in the 2001 Census[better source needed]) and ranks 20th in the list of most spoken languages. It is one of the 22 scheduled languages of India and was the first Indian language to be declared a classical language by the Government of India in 2004. Tamil is one of the longest surviving classical languages in the world. It has been described as "the only language of contemporary India which is recognisably continuous with a classical past." The two earliest manuscripts from India, acknowledged and registered by UNESCO Memory of the World register in 1997 and 2005, are in Tamil. Tamil is an official language of Tamil Nadu, Puducherry, Andaman and Nicobar Islands, Sri Lanka and Singapore. It is also recognized as minority language in Canada, Malaysia, Mauritius and South Africa. After independence, Modern Standard Urdu, the Persianised register of Hindustani became the national language of Pakistan. During British colonial times, a knowledge of Hindustani or Urdu was a must for officials. Hindustani was made the second language of British Indian Empire after English and considered as the language of administration. The British introduced the use of Roman script for Hindustani as well as other languages. Urdu had 70 million speakers in India (as per the Census of 2001), and, along with Hindi, is one of the 22 officially recognised regional languages of India and also an official language in the Indian states of Jammu and Kashmir, Delhi, Uttar Pradesh, Bihar and Telangana that have significant Muslim populations. Gujarati is an Indo-Aryan language. It is native to the west Indian region of Gujarat. Gujarati is part of the greater Indo-European language family. Gujarati is descended from Old Gujarati (c. 1100 – 1500 CE), the same source as that of Rajasthani. Gujarati is the chief language in the Indian state of Gujarat. It is also an official language in the union territories of Daman and Diu and Dadra and Nagar Haveli. According to the Central Intelligence Agency (CIA), 4.5% of population of India (1.21 billion according to 2011 census) speaks Gujarati. This amounts to 54.6 million speakers in India. Kannada language is a Dravidian language which branched off from Kannada-Tamil sub group around 500 B.C.E according to the Dravidian scholar Zvelebil. According to the Dravidian scholars Steever and Krishnamurthy, the study of Kannada language is usually divided into three linguistic phases: Old (450–1200 CE), Middle (1200–1700 CE) and Modern (1700–present). The earliest written records are from the 5th century, and the earliest available literature in rich manuscript (Kavirajamarga) is from c. 850. Kannada language has the second oldest written tradition of all vernacular languages of India. Current estimates of the total number of epigraph present in Karnataka range from 25,000 by the scholar Sheldon Pollock to over 30,000 by the Sahitya Akademi, making Karnataka state "one of the most densely inscribed pieces of real estate in the world". According to Garg and Shipely, more than a thousand notable writers have contributed to the wealth of the language. Malayalam (/mæləˈjɑːləm/; മലയാളം, Malayāḷam ? [ maləjaːɭəm]) has official language status in the state of Kerala and in the union territories of Lakshadweep and Puducherry. It belongs to the Dravidian family of languages and is spoken by some 38 million people. Malayalam is also spoken in the neighboring states of Tamil Nadu and Karnataka; with some speakers in the Nilgiris, Kanyakumari and Coimbatore districts of Tamil Nadu, and the Dakshina Kannada and the Kodagu district of Karnataka. Malayalam originated from Middle Tamil (Sen-Tamil) in the 7th century. As Malayalam began to freely borrow words as well as the rules of grammar from Sanskrit, the Grantha alphabet was adopted for writing and came to be known as Arya Eluttu. This developed into the modern Malayalam script. Odia (formerly spelled Oriya) is the only modern language officially recognized as a classical language from the Indo-Aryan group. Odia is primarily spoken in the Indian state of Odisha and has over 40 million speakers. It was declared as a classical language of India in 2014. Native speakers comprise 91.85% of the population in Odisha. Odia is thought to have originated from Udra Prakrit similar to Udra Magadhi, a language spoken in eastern India over 2,500 years ago. The history of Odia language can be divided to Old Odia (3rd century BC –1200 century AD), Early Middle Odia (1200–1400), Middle Odia (1400–1700), Late Middle Odia (1700–1870) and Modern Odia (1870 till present day). The National Manuscripts Mission of India have found around 213,000 unearthed and preserved manuscripts written in Odia. Punjabi, written in the Gurmukhi script in India, is one of the prominent languages of India with about 32 million speakers. In Pakistan it is spoken by over 80 million people and is written in the Shahmukhi alphabet. It is mainly spoken in Punjab but also in neighboring areas. It is an official language of Delhi and Punjab. Asamiya or Assamese language is most popular in the state of Assam and Brahmaputra Valley. It's an Eastern Indo-Aryan language having more than 10 million speakers as per world estimates by Encarta. Maithili (/ˈmaɪtɪli/; Maithilī) is an Indo-Aryan language spoken in the Bihar and Jharkhand states of India. In Nepal, it is spoken in the eastern Terai, and is the second most prevalent language of Nepal. Tirhuta was formerly the primary script for written Maithili. Less commonly, it was also written in the local variant of Kaithi. Today it is written in the Devanagari script. In 2003, Maithili was included in the Eighth Schedule of the Indian Constitution as a recognised regional language of India, which allows it to be used in education, government, and other official contexts. In 2004, the Government of India declared that languages that met certain requirements could be accorded the status of a "Classical Language in India".. Over the next few years, several languages were granted the Classical status, and demands have been made for other languages, including Marathi. High antiquity of its early texts/recorded history over a period of 1500–2000 years; a body of ancient literature/texts, which is considered a valuable heritage by generations of speakers; the literary tradition be original and not borrowed from another speech community; the classical language and literature being distinct from modern, there may also be a discontinuity between the classical language and its later forms or its offshoots. Two major international awards for scholars of eminence in Classical Indian Languages are awarded annually. A Centre of Excellence for Studies in Classical Languages is set up. The University Grants Commission will be requested to create, to start with at least in the Central Universities, a certain number of Professional Chairs for Classical Languages for scholars of eminence in Classical Indian Languages. The 2001 census identified the following native languages having more than one million speakers. Most of them are dialects/variants grouped under Hindi. India has several languages in use; choosing any single language as an official language presents problems to all those whose "mother tongue" is different. However, all the boards of education across India recognise the need for training people to one common language. There are complaints that in North India, non-Hindi speakers have language trouble. Similarly, there are complaints that North Indians have to undergo difficulties on account of language when travelling to South India. It is common to hear of incidents that result due to friction between those who strongly believe in the chosen official language, and those who follow the thought that the chosen language(s) do not take into account everyone's preferences. Local official language commissions have been established and various steps are being taken in a direction to reduce tensions and friction. There are conflicts over linguistic rights in India. The first major linguistic conflict, known as the Anti-Hindi agitations of Tamil Nadu, took place in Tamil Nadu against the implementation of Hindi as the official language of India. Political analysts consider this as a major factor in bringing DMK to power and leading to the ousting and nearly total elimination of the Congress party in Tamil Nadu. Strong cultural pride based on language is also found in other Indian states such as Karnataka, West Bengal, Punjab and Maharashtra. To express disapproval of the imposition of Hindi on its states' people as a result of the central government, the government of Maharashtra made the state languages mandatory in educational institutions. Most languages in India are written in Brahmi-derived scripts, such as Devanagari, Tamil, Telugu, Kannada, Meitei Mayek, Odia, Eastern Nagari - Assamese/Bengali, etc., though Urdu is written in a script derived from Arabic, and a few minor languages such as Santali use independent scripts. Various Indian languages have their own scripts. Hindi, Marathi, Maithili and Angika are languages written using the Devanagari script. Most major languages are written using a script specific to them, such as Assamese (Asamiya) with Asamiya, Bengali with Bengali, Punjabi with Gurmukhi, Meitei with Meitei Mayek, Odia with Odia script, Gujarati with Gujarati, etc. Urdu and sometimes Kashmiri, Saraiki and Sindhi are written in modified versions of the Perso-Arabic script. With this one exception, the scripts of Indian languages are native to India. Languages like Kodava that didn't have a script whereas Tulu which had a script adopted Kannada due to its readily available printing settings; these languages have taken up the scripts of the local official languages as their own and are written in the Kannada script. Silver coin issued during the reign of Rudra Singha with Assamese inscriptions. North Indian Brahmi found in Ashok pillar. The Halmidi inscription, the oldest known inscription in the Kannada script and language. The inscription is dated to the 450 CE - 500 CE period. An early Telugu inscription found in the Krishna district of Andhra Pradesh. ^ a b c "Constitution of India". Archived from the original on 2 April 2012. Retrieved 21 March 2012. ^ a b "Official Language Act | Government of India, Ministry of Electronics and Information Technology". meity.gov.in. Retrieved 24 January 2017. ^ Salzmann, Zdenek; Stanlaw, James; Adachi, Nobuko (8 July 2014). "Language, Culture, and Society: An Introduction to Linguistic Anthropology". Westview Press – via Google Books. ^ "Official Language - The Union -Profile - Know India: National Portal of India". Archive.india.gov.in. Retrieved 28 December 2017. ^ "Scheduled Languages in descending order of speaker's strength - 2011" (PDF). Registrar General and Census Commissioner of India. ^ a b "Indo-Aryan languages". Encyclopædia Britannica Online. Retrieved 10 December 2014. ^ a b c "Hindi languages". Encyclopædia Britannica Online. Retrieved 10 December 2014. ^ a b c d e f g h i Moseley, Christopher (10 March 2008). Encyclopedia of the World's Endangered Languages. Routledge. ISBN 978-1-135-79640-2. ^ "Seven decades after Independence, many small languages in India face extinction threat". ^ a b Khan, Saeed (25 January 2010). "There's no national language in India: Gujarat High Court". The Times of India. Retrieved 5 May 2014. ^ a b Press Trust of India (25 January 2010). "Hindi, not a national language: Court". The Hindu. Ahmedabad. Retrieved 23 December 2014. ^ a b "Census Data 2001 : General Note". Census of India. Retrieved 11 December 2014. ^ a b Abidi, S.A.H. ; Gargesh, Ravinder (2008). "4. Persian in South Asia". In Kachru, Braj B. (ed.). Language in South Asia. Kachru, Yamuna & Sridhar, S.N. Cambridge University Press. pp. 103–120. ISBN 978-0-521-78141-1. ^ "Decline of Farsi language - The Times of India". The Times of India. Retrieved 26 October 2015. ^ "The World Factbook". www.cia.gov. Retrieved 25 October 2015. ^ Nehru, Jawaharlal; Gandhi, Mohandas (1937). The question of language: Issue 6 of Congress political and economic studies. K. M. Ashraf. ^ a b c Hardgrave, Robert L. (August 1965). The Riots in Tamilnad: Problems and Prospects of India's Language Crisis. Asian Survey. University of California Press. ^ Avari, Burjor (11 June 2007). India: The Ancient Past: A History of the Indian Sub-Continent from C. 7000 BC to AD 1200. Routledge. ISBN 9781134251629. ^ Andronov, Mikhail Sergeevich (1 January 2003). A Comparative Grammar of the Dravidian Languages. Otto Harrassowitz Verlag. ISBN 9783447044554. ^ Krishnamurti, Bhadriraju (2003). The Dravidian Languages. Cambridge University Press. ISBN 0521771110. ^ Kachru, Yamuna (1 January 2006). Hindi. London Oriental and African language library. John Benjamins Publishing. p. 1. ISBN 90-272-3812-X. ^ Brass, Paul R. (2005). Language, Religion and Politics in North India. iUniverse. p. 129. ISBN 978-0-595-34394-2. ^ Kulshreshtha, Manisha; Mathur, Ramkumar (24 March 2012). Dialect Accent Features for Establishing Speaker Identity: A Case Study. Springer Science & Business Media. p. 16. ISBN 978-1-4614-1137-6. ^ a b Aijazuddin Ahmad (2009). Geography of the South Asian Subcontinent: A Critical Approach. Concept Publishing Company. pp. 123–124. ISBN 978-81-8069-568-1. Retrieved 17 December 2014. ^ Lewis, M. Paul; Simons, Gary F.; Fennig, Charles D., eds. (2014). "Ethnologue: Languages of the World (Seventeenth edition) : India". Dallas, Texas: SIL International. Retrieved 15 December 2014. ^ Ethnologue : Languages of the World (Seventeenth edition) : Statistical Summaries Archived 17 December 2014 at the Wayback Machine. Retrieved 17 December 2014. ^ Singh, Shiv Sahay (22 July 2013). "Language survey reveals diversity". The Hindu. Retrieved 15 December 2014. ^ Banerjee, Paula; Chaudhury, Sabyasachi Basu Ray; Das, Samir Kumar; Bishnu Adhikari (2005). Internal Displacement in South Asia: The Relevance of the UN's Guiding Principles. SAGE Publications. p. 145. ISBN 978-0-7619-3329-8. Retrieved 17 December 2014. ^ Dasgupta, Jyotirindra (1970). Language Conflict and National Development: Group Politics and National Language Policy in India. Berkeley: University of California, Berkeley. Center for South and Southeast Asia Studies. p. 47. ISBN 9780520015906. ^ a b c Mallikarjun, B. (5 August 2002). "Mother Tongues of India According to the 1961 Census". Languages in India. M. S. Thirumalai. ISSN 1930-2940. Retrieved 11 December 2014. ^ a b Vijayanunni, M. (26–29 August 1998). "Planning for the 2001 Census of India based on the 1991 Census" (PDF). 18th Population Census Conference. Honolulu, Hawaii, USA: Association of National Census and Statistics Directors of America, Asia, and the Pacific. Archived from the original (PDF) on 19 November 2008. Retrieved 17 December 2014. ^ Mallikarjun, B. (7 November 2001). "Languages of India according to 2001 Census". Languages in India. Retrieved 17 December 2014. ^ Wischenbart, Ruediger (11 February 2013). The Global EBook Market: Current Conditions & Future Projections. "O'Reilly Media, Inc.". p. 62. ISBN 978-1-4493-1999-1. Retrieved 18 December 2014. ^ Schiffrin, Deborah; Fina, Anna De; Nylund, Anastasia (2010). Telling Stories: Language, Narrative, and Social Life. Georgetown University Press. p. 95. ISBN 1-58901-674-2. Retrieved 18 December 2014. ^ Sreevatsan, Ajai (10 August 2014). "Where are the Sanskrit speakers?". The Hindu. Chennai. Retrieved 15 December 2014. ^ ORGI. "Census of India: Comparative speaker's strength of Scheduled Languages-1951, 1961, 1971, 1981, 1991 ,2001 and 2011" (PDF). ^ "How languages intersect in India". Hindustan Times. ^ "How many Indians can you talk to?". ^ "India : Languages". Encyclopædia Britannica Online. Retrieved 2 December 2014. ^ "Indo-Aryan languages". Encyclopædia Britannica. ^ West, Barbara A. (1 January 2009). Encyclopedia of the Peoples of Asia and Oceania. Infobase Publishing. p. 713. ISBN 978-1-4381-1913-7. ^ Levinson, David; Christensen, Karen (2002). Encyclopedia of Modern Asia: China-India relations to Hyogo. Charles Scribner's Sons. p. 299. ISBN 978-0-684-31243-9. ^ Ishtiaq, M. (1999). Language Shifts Among the Scheduled Tribes in India: A Geographical Study. Delhi: Motilal Banarsidass Publishers. pp. 26–27. ISBN 9788120816176. Retrieved 7 September 2012. ^ "Language in South Asia". Books.google.com. Retrieved 28 December 2017. ^ Robbins Burling. "On "Kamarupan"" (PDF). Sealang.net. Retrieved 28 December 2017. ^ a b Niclas Burenhult. "Deep linguistic prehistory with particular reference to Andamanese" (PDF). Working Papers. Lund University, Dept. of Linguistics (45): 5–24. Retrieved 2 December 2014. ^ Anderson, Gregory D. S. (2007). The Munda Verb: Typological Perspectives. Walter de Gruyter. p. 6. ISBN 978-3-11-018965-0. ^ Anderson, G. D. S. (6 April 2010). "Austro-asiatic languages". In Brown, Keith; Ogilvie, Sarah (eds.). Concise Encyclopedia of Languages of the World. Elsevier. p. 94. ISBN 978-0-08-087775-4. ^ Greenberg, Joseph (1971). "The Indo-Pacific hypothesis." Current trends in linguistics vol. 8, ed. by Thomas A. Sebeok, 807.71. The Hague: Mouton. ^ Abbi, Anvita (2006). Endangered Languages of the Andaman Islands. Germany: Lincom GmbH. ^ "50th Report of the Commissioner for Linguistic Minorities in India (July 2012 to June 2013)" (PDF). Commissioner for Linguistic Minorities, Ministry of Minority Affairs, Government of India. Archived from the original (PDF) on 26 December 2014. Retrieved 17 September 2016. ^ a b c d e f Guha, Ramachandra (10 February 2011). "6. Ideas of India (section IX)". India After Gandhi: The History of the World's Largest Democracy. Pan Macmillan. pp. 117–120. ISBN 978-0-330-54020-9. Retrieved 3 January 2015. ^ a b c d e "Constitution of India as of 29 July 2008" (PDF). The Constitution Of India. Ministry of Law & Justice. Archived from the original (PDF) on 21 June 2014. Retrieved 13 April 2011. ^ a b Thomas Benedikter (2009). Language Policy and Linguistic Minorities in India: An Appraisal of the Linguistic Rights of Minorities in India. LIT Verlag Münster. pp. 32–35. ISBN 978-3-643-10231-7. Retrieved 19 December 2014. ^ a b "Official Languages Act, 1963 (with amendments)" (PDF). Indian Railways. 10 May 1963. Retrieved 3 January 2015. ^ "Chapter 7 - Compliance of Section 3(3) of the Official Languages Act, 1963" (PDF). Committee of Parliament on Official Language report. Archived from the original (PDF) on 20 February 2012. ^ a b c d e "Statement 1 - Abstract of Speakers' Strength of Languages and Mother Tongues - 2001". Government of India. Archived from the original on 14 October 2013. Retrieved 11 December 2014. ^ Hindi (2005). Keith Brown (ed.). Encyclopedia of Language and Linguistics (2 ed.). Elsevier. ISBN 0-08-044299-4. ^ "Rajya Sabha MPs can now speak in any of 22 scheduled languages in the house". Retrieved 24 July 2018. ^ "Digital vitality of Uralic languages". ^ Snoj, Jure. "20 maps of India that explain the country". Call Of Travel. Retrieved 17 April 2016. ^ "Memorandum of Settlement on Bodoland Territorial Council (BTC)". South Asia Terrorism Portal. 10 February 2003. Retrieved 25 December 2014. ^ ANI (10 September 2014). "Assam government withdraws Assamese as official language in Barak Valley, restores Bengali". DNA India. Retrieved 25 December 2014. ^ "DOL". Archived from the original on 20 June 2010. Retrieved 21 January 2019. ^ "Commissioner Linguistic Minorities". Archived from the original on 8 October 2007. Retrieved 21 January 2019. ^ "THE OFFICIAL LANGUAGES ACT, 1963". Archived from the original on 1 June 2009. Retrieved 21 January 2019. ^ "National Portal of India : Know India : Profile". Archived from the original on 17 April 2007. Retrieved 21 January 2019. ^ "Committee of Parliament on Official Language report" (PDF). Archived from the original (PDF) on 20 February 2012. Retrieved 21 January 2019. ^ "The World Factbook". www.cia.gov. Central Intelligence Agency. Retrieved 21 February 2018. ^ "Summary by language size". Ethnologue. Retrieved 21 February 2019. ^ "The Bengali Language at Cornell - Department of Asian Studies". Lrc.cornell.edu. Retrieved 28 December 2017. ^ Chu, Emily. "UNESCO Dhaka Newsletter" (PDF). UNESCO. Retrieved 24 January 2015. ^ a b "Language and Mother Tongue". MHA, Gov. of India. ^ Sandra Küng (6 June 2013). "Translation from Gujarati to English and from English to Gujarati - Translation Services". Archived from the original on 17 October 2014. ^ Laurie Bauer, 2007, The Linguistics Student’s Handbook, Edinburgh, p. 300. ^ "Dakshina Kannada District: Dakshin Kannada also called South Canara - coastal district of Karnataka state". Karnatakavision.com. Retrieved 20 February 2012. ^ "Kodagu-Kerala association is ancient". The Hindu. Chennai, India. 26 November 2008. ^ "Virajpet Kannada Sahitya Sammelan on January 19". The Hindu. Chennai, India. 9 December 2008. ^ Asher, R; Kumari, T. C. (11 October 2013). Malayalam. Taylor & Francis. p. xxiv. ISBN 978-1-136-10084-0. Retrieved 19 December 2016. ^ Andronov, Mikhail Sergeevich. A Grammar of the Malayalam Language in Historical Treatment. Wiesbaden: Harrassowitz, 1996. ^ "Mixed views emerge as Orissa becomes Odisha". India Today. Retrieved 10 November 2011. ^ CENSUS OF INDIA 2011. "LANGUAGE" (PDF). Government of India. p. 12. ^ Pattanayak, Debi Prasanna; Prusty, Subrat Kumar. Classical Odia (PDF). Bhubaneswar: KIS Foundation. p. 54. Retrieved 26 July 2016. ^ Kumarl, Chethan (19 July 2016). "Manuscript mission: Tibetan beats all but three Indian languages - Times of India". The Times of India. Retrieved 11 November 2016. ^ "Common Languages of India - Popular Indian Language - Languages Spoken in India - Major Indian Languages". India-travel-agents.com. Retrieved 28 December 2017. ^ "Languages Spoken by More Than 10 Million People". Web.archive.org. Archived from the original on 3 December 2007. Retrieved 28 December 2017. ^ Sah, K. K. (2013). "Some perspectives on Maithili". Nepalese Linguistics (28): 179–188. ^ Brass, P. R. (2005). Language, Religion and Politics in North India. Lincoln: iUniverse. ISBN 0-595-34394-5. Retrieved 1 April 2017. ^ Yadava, Y. P. (2013). Linguistic context and language endangerment in Nepal. Nepalese Linguistics 28: 262–274. ^ Singh, P., & Singh, A. N. (2011). Finding Mithila between India's Centre and Periphery. Journal of Indian Law & Society 2: 147–181. ^ "India sets up classical languages". BBC. 17 September 2004. Retrieved 1 May 2007. ^ Clara Lewis (16 April 2018). "Clamour grows for Marathi to be given classical language status". The Times of India. ^ "Front Page : Tamil to be a classical language". Chennai, India: The Hindu. 18 September 2004. Retrieved 1 August 2010. ^ "National : Sanskrit to be declared classical language". Chennai, India: The Hindu. 28 October 2005. Retrieved 1 August 2010. ^ a b "Declaration of Telugu and Kannada as classical languages". Press Information Bureau. Ministry of Tourism and Culture, Government of India. Retrieved 31 October 2008. ^ "Odia gets classical language status". The Hindu. 20 February 2014. Retrieved 20 February 2014. ^ "Milestone for state as Odia gets classical language status". The Times of India. ^ "CLASSICAL LANGUAGE STATUS TO KANNADA". Press Information Bureau, Government of India. 8 August 2006. Retrieved 6 November 2008. ^ Singh, Binay (5 May 2013). "Removal of Pali as UPSC subject draws criticism". The Times of India. Retrieved 20 February 2014. ^ "Reviving classical languages - Latest News & Updates at Daily News & Analysis". Dnaindia.com. 13 August 2015. Retrieved 28 December 2017. ^ "Marathi may become classical language". The Indian Express. 4 July 2013. ^ "Classical Status to Oriya Language". Pib.nic.in (Press release). 14 August 2013. ^ "Language and Globalization: Center for Global Studies at the University of Illinois". Archived from the original on 10 May 2013. ^ Prakash, A Surya (27 September 2007). "Indians are no less racial". The Pioneer. Archived from the original on 27 September 2007. ^ "Marathi a must in Maharashtra schools — India News". IBNLive. 3 February 2010. Retrieved 1 August 2010. ^ "File:Indoarische Sprachen.png". Commons.wikipedia.org. Retrieved 28 December 2017. ^ "The Indo-Aryan Languages". Books.google.com. Retrieved 28 December 2017. ^ "Encyclopaedia of Scheduled Tribes in India". Books.google.com. Retrieved 28 December 2017. ^ "The Brahmaputra Basin Water Resources". Books.google.com. Retrieved 28 December 2017. ^ "Kodava". Ethnologue. Retrieved 14 October 2016.